I missed the Queen’s Christmas broadcast at 3pm on Christmas Day, but managed to catch it on YouTube later that day. Isn’t technology wonderful? Then a few days later, looking for something else, I came across this documentary Cue the Queen: Celebrating the Christmas Speech covering nearly 100 years of royal broadcasts. Sitting and watching the Queen’s speech is a very British thing to do but an important part of the speech is the Queen’s link with the Commonwealth, an institution she is fond of and which is important to its members. And in case you question the significance of the Commonwealth, I recall South Africa being really chuffed at joining the Commonwealth again after the 1994 elections brought about the end of Apartheid. Also, more recently Rwanda, Burundi, Congo and Mozambique joined the Commonwealth making a break with the tradition that it only include what were British imperial territories. The Commonwealth evolved out of what was the British Empire. Given how African countries regard the Commonwealth, I wonder how the current de-colonising movement reconciles itself with the idea of Commonwealth or does it reject the institution too? The term Empire conjures up bad and good images depending on your experience and reading, the same with the term Commonwealth and even Monarchy. In the same way the Queen and her institutions such as the OBE are criticised or welcomed, there are royal practices elsewhere which evoke similar responses. A recent trip to Rwanda happened to co-incide with one by the King of Morocco. This would have gone by unnoticed except for the fact that the conference centre, opened earlier this year, was decked out in green and red (not ideal for colour-blind sufferers) and that significant roads were closed – one for a whole day and another, the next day for about an hour. The first menat we had to detour in a city not too well known, whilst the second saw us caught in a shopping centre parking lot for the entire time the road was closed. Someone came past to tell us the King of Morocco was visiting the bank he was buying (I haven’t tried to verify this purchase). I have no issue with such visits, and royalty and other significant people have a right to travel and do business, but do they have a right, without warning to the locals to disrupt business in this way? I later heard the disruptions had been notified through the press – but not all of us read Kinyarwandan…Someone else mentioned that this hadn’t been too bad. The King of Jordan’s visit saw the whole city centre shut off for a week! And it’s not just Rwanda. We’ve had to wait for two hours on a Ghanaian motorway for the President’s cavalcade to pass by and similarly in Tanzania, we’ve been virtually pushed off the road pending a diplomatic fly-by on tar… eventually. Closer to home, in London, I recall getting very frustrated when teaching as I had to wait at the traffic lights on the A4 for some diplomat or other ‘important’ person to pass by… eventually… before I could get into the college to educate the next generation. And I have to remind myself that the police cordon I had to cross in November 2004 to do my viva was not because George Bush was passing through but rather to keep the protesters from blocking the roads in protest at his visit. You’d be forgiven if you thought by now that I am anti-monarchy. I’m not, I’m afraid. One of my fondest memories is the visit of the Queen and Prince Philip to the Bank of England when I worked there – the Duke did his walk-about on our side of the welcome gathering and enquired why we’d left our desks to come and see him and the Queen. He was sure we had more important things to do. This was followed by a ‘Thank you for coming to see us though.’ A gentle acknowledgement that there was more to life… Admission time: I’m a sucker for pomp and ceremony (a form of escapism?) but in its place and time and that doesn’t extend to interfering with the economy or education. In this day and age when equality is being promoted and the safety of leaders is potentially under greater threat than in previous years (a statement open for debate), surely keeping a low profile and blending in is called for? One of the striking comments in the documentary on the Queen’s Christmas Speech was towards the end when after hosting a huge banquet, she quietly made her way to a train to arrive the next morning in time for her next engagement. No fuss or bother. Given her time on the throne and extent of her reign across countries, I for one hope the Queen has secretly written an autobiography or reflection on her years in office which will eventually be published – it would be another facet in the incredible diamond we call history. It would also, by default, explore how the monarchy has changed and possibly include reasons for the change. People in leadership positions are doomed if they do and doomed if they don’t. I can’t help but think of how Jan Smuts was viewed during his command of the forces in East Africa in 1916 – some loved him and felt he did the right thing being in the frontlines with the men, whilst others felt he should have stayed at headquarters and commanded from there. There are possibly more similarities between the Queen’s behaviour today and that of Smuts in East Africa than what we see with most African leaders (President Magafule appears to be an exception). On the pragmatic side, while we are forced to have these ‘time outs’, it’s worth considering why we insist on rushing around, filling every minute with doing something. My world didn’t end and students were still ready for their exams despite all the time I’ve given to waiting for royalty (formal and informal) to pass to who knows where. And it gives us something to talk (or complain) about. As an historian I’ve come to realise that I need an open mind especially when using original documents of the time. History is like a big jigsaw puzzle under construction; it can also be thought of in terms of GoogleMaps: you have the overview but can zoom into get the finer detail. In my jigsaw puzzle analogy, the artist has mixed layers of depth in one image. My other way of explaining the multiple versions of an historical event is to use a diamond. There are so many facets individually or severally caught by the light, all making up the whole of what is a diamond. How we look at the diamond, determines which facet(s) we see. For me, this is an invaluable position to be in – you’re always expecting the story to evolve in ways to accommodate new information, including that which appears to be completely contradictory. Working on World War 1 in Africa, watching the story evolve can be more radical than say the war on the Western Front or other episodes of our lives which have been the focus of lengthy detailed study. How do we fit the Christmas Truce into the ‘lions led by donkey’s’ idea of the war? How does knowing Belgium was so much more active in the Lake Tanganyika diminish or add to Spicer-Simson’s achievements? What does it do for race relations knowing that white South Africa had as much trouble getting military equipment to fight in the war as carriers and soldiers of all ethnic groups had getting food in West and East Africa? Recently (December 2016), I came across an image on Pinterest which piqued my curiosity and which demanded verification before putting into the public domain (annoyingly, I didn’t keep the Pinterest link). It was to do with the book of Barnabas of which you can read a summary on Wikipedia (most comprehensive and referenced). The latest discovery is a copy of this text in Aramaic suggesting it might be older than the other two known copies of the text. The question I have is if this book is found to be legitimate and the contents verified as far as possible, how does this impact on what many of us were taught as children? Finding a reliable source for this latest discovery has been a challenge (which in itself raises questions) but here’s a sample of reports found: Daily Mail (Feb 2016), LatinTimes, Catholic Answers. In my search for a reliable source, I discovered that this story was ‘big’ in the press in 2014 where we find a slightly more reliable account in The Guardian, but even this is challenged by views in Counter Current (2014). My questions now are: why this revival in 2016? If the document is false, what was the purpose of putting it into the public domain? Who did so? If it is true? I go back to my earlier question: what does this mean for many brought up believing that religious texts are the absolute truth? My cross-cultural experiences suggest that whether or not this document is proven to be true, it’s about having an open mind, allowing ourselves to be challenged in understanding why individuals (including countries) acted the way they did. By doing this we are able to shed more light on the diamond and gain a more indepth and holistic picture of the time. Experience also suggests such an approach reduces the temptation to lay blame at specific feet, something we humans tend to relish in. Recent enquiries concerning South Africa’s involvement at Delville Wood during the Battle for the Somme in July 1916 has brought to light that there is very little written about it. And although it’s the Western Front, the men I’m focusing on were African (South African to be specific). Delville Wood is often regarded as the white English South African population’s equivalent of Gallipoli, Verdun or Britain’s first day of the Somme. For those wondering why I’ve specified white English South African, there are four special World War 1 commemorative events in South Africa reminiscent of the cultural diversity in the country then and now. In addition to Delville Wood which is generally commemorated every 11 November along with the rest of the world, there is Mendi Day on 21 February remembering all those who drowned when the SS Mendi went down. For me, it’s a fitting day to remember the over 19,400 black labourers who didn’t drown and who served on the Western Front and in Africa suffering the same privations and consequences of war others did. Then we have the white Afrikaans 1914 Rebellion more specifically the execution of Jopie Fourie who was found guilty of treason – he hadn’t resigned his commission before joining the rebels and finally, 20 September is Square Hill Day which is when the Cape (Coloured) Corps held their ground in Palestine. For readers aware of South Africa’s involvement in World War 1, these four remembrance events together demonstrate the richness of the country. However, missing from the ‘official’ events is that of East Africa and South West Africa. I don’t know of anything to commemorate South Africa’s invasion of South West in 1914/5, but the East Africa campaign is commemorated (knowingly or otherwise) by the Comrades Marathon which is run every year. Back to Delville Wood. As far as I can tell, the best overarching account of South Africa’s involvement at the Somme remains Ian Uys’ work. I haven’t read any yet so cannot comment further. Peter Digby has written unit histories, a few others have compiled family history accounts, and then there is the website of Delville Wood itself. It is high time some brave historian (enthusiast or academic took on the challenge of writing a comprehensive account of South Africa’s involvement on the Western Front). For those living in the Durham area, a novel approach to theatre-going featured the Battle of the Somme in a production 1916: No turning back (Thursday 21 July to Sunday 28 August 2016). The production takes an unusual approach to engaging the audience in experiencing the war and gives a flavour of what the South African troops might have experienced. For those unable to get to Durham to see 1916: No tunrning back, Peter Dicken’s speech at Delville Wood 2016 gives some idea and an overview of what happened. We started this memorial service, with short blasts from World War 1 replica whistles, this was the signal blown by individual officers to send their troops “over the top” during the Somme Offensive and aside from the gun and artillery fire this is the last mechanical sound thousands of soldiers heardFrightening isn’t it? The sound of these whistles had some men literally freeze in pure terror. What a harrowing and poignant start and to consider that it was a sound that was going to repeat itself again and again all along the Somme salient. Why is the Thiepval memorial significant to South Africans? It’s a surprise to many in The Royal British Legion and in South African veteran and military circles, but the official designation of this memorial is the “Memorial to the 72, 195 British and South African servicemen, who died in the Battle of the Somme of the First World War between 1915 – 1918, with no known grave”. This memorial is built right across the front lines as they stood on the 1st July 1916, the very same day the British Army suffered 20 000 men killed and a further 40 000 wounded – it’s literally on this very ground that we are standing on now that much of this massive bloodletting took place. Humbling – no doubt! This memorial however, speaks not simply of that first day but of the whole Battle of the Somme. On stone panels around the memorial’s arches are recorded the names of the men of the United Kingdom, 71,336 and 858 South Africans. To, think – these are only the ‘missing’ from the battle of the Somme – men who have no known grave, or on whose gravestone is inscribed the words “unknown soldier”. As to names on actual headstones, around us are thousands. The Somme Offensive is off the scale – it is the most bloodiest battle in the entire history of mankind, – the sad truth – it advanced only 10 km along the front with the grim total of 1 million men dead or wounded from both sides littered in its wake.And it all began with a Bang!, a very big one. Soldiers of the British Forces here and soldiers of the South African forces just over the way at Delville Wood witnessed the biggest explosion ever seen until then – The Lochnagar mine explosion was so big that debris from the explosion hit a British spotter plane 4000 ft up in the air, the detonation of this large mine and 8 others under German positions was said to be heard as far as England, and it was the start of carnage on a epic level. 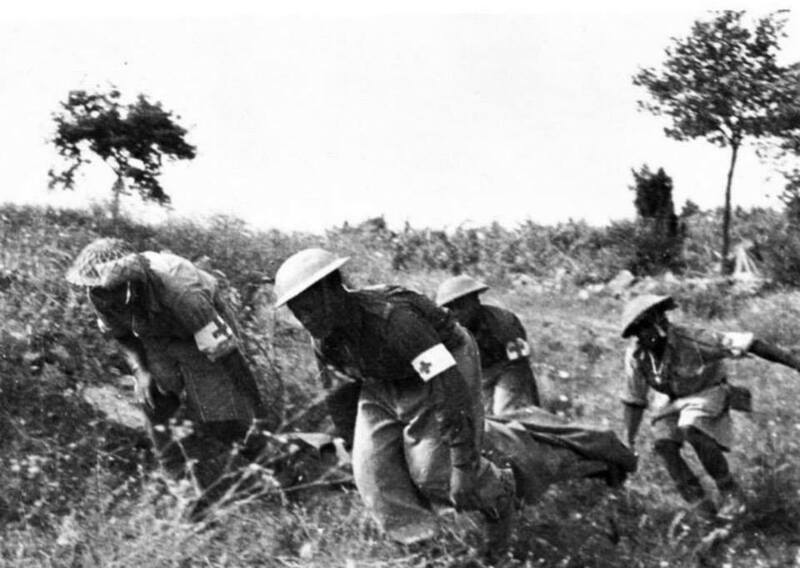 On the South African side of the Somme Offensive things started off remarkably well, the 1st South African Brigade was ordered to advance and to capture Delville Wood on the 14th July and “hold it at all costs”. I’ve recently spent time at the SANDF Document Centre (South African Military Archives) in Pretoria and have as usual been astounded at the amount of material held. Yet, most researchers only access the military service cards. With this in mind and the snippets I accessed, I wonder what what treasures are still to be uncovered about South African involvement at Delville Wood and on the Western Front generally for men (and women) of all South Africa’s ethnic groups. It’s become clear to me that World War in Africa cannot exclude what happened at Delville Wood and Square Hill – these experiences helped mould the country into what it is and should be given the same historical treatment that the East Africa campaign currently receives. A hundred years later is not too late to remember! In 2015, 88% of global cases and 90% of global deaths occured in the African Region. Between 2000 and 2015, the number of malaria cases declined by 42% while the malaria death rate declined by 66% in the African Region. How to prevent being bitten and whether or not to take anti-malarials is an on-going debate and one I keep an eye on as I’m allergic to some of the prescribed anti-malarials, don’t see why the price of the tablets should be so high if bought outside Africa, are insisted upon by travel clinics across a region even if it is known that mosquitoes are only to be found in specific locations and do not trust the long-term effects of putting such drugs into my body. However, I am aware enough to know that I do not want to contract Malaria as its consequences can be quite horrific. So what are the options? The most recent research suggest chicken odour deters the anopheles mosquito. The photo in this article (sort of) proves another point I’d been meaning to check – anopheles mosquito has striped legs!! I have tried on recent visits to Africa to ask mosquitoes to just hang on for a bit before embarking on their vampire exercise so that I could look at their legs first. Alas, none of them has been that interested in my looking at their legs. (This handy site explains the different mosquitoes for anyone interested – although it doesn’t mention stripy legs for the anophales; also no mention of stripes in this article but a short history of research into Malaria in South Africa including findings from World War 1). And the last paragraph of this article, gives some other identifiers of anopheles mosquitoes – I might put these to the test on my next visit to a malaria area. Another deterent, one I’ve been aware of for some years now, is elephant dung. The challenge here is collecting it and then transporting it cross border… This seems to be a popular repellent in India though. One of the things we were brought up to use was citronella oils etc, however the effectiveness of this has been called into question and research suggests citronella is not as effective as other preventatives. The UC IPM supports this suggesting citronella works best outdoors with little wind movement. I had heard from a scientist but haven’t been able to find documentary evidence that citronella actually attracts mosquitoes. This makes sense if citronella is being burnt as it is generally away from the body. Covering up – a challenge getting the balance right between keeping cool and wearing enough clothing to cover the body which is thick enough to stop mosquitos penetrating. Despite all these precautions some of us are just prone to getting bitten so it’s rather reassuring to know that there are now test kits (SA version) which can be administered personally. I’ve come close to using one but thankfully one or two crucial symptoms were missing which delayed the need. Research into malaria has developed over the years. During the First World War, quinine was the main preventative as was covering up – the German officers kept a close eye on their men taking precautions whereas the British appeared more lax. However, quinine had its own issues which may have exaccerbated the signs and symptoms of malaria and the liquid form known as Lettow Schnapps wasn’t all that tasty. It’s incredible how something so small can be such a significan killer and that we’re still struggling to find a way to deal with it. I approached reading the book with some trepidation. One, I met Brad when he spoke at the Great War in Africa Association Conference in May this year and two, I am myself working on a biography of Kitchener. The big question was: would Brad have taken my thunder and would there be anything left for me to say about Kitchener, and if he didn’t address what I thought was important about the man, how would I convey this in a professional and academic assessment of the book? Reading the opening pages resulted in a mix of emotions. Relief – it was clear Brad had not touched on areas I thought important to highlight (and I’m not going to expand on them here as I might as well reproduce my manuscript) and anticipation at what was going to follow that would add to the already 64+ biographies on the man. The value of Brad’s book, written in the traditional military biography style is that it brings the previous biographies up to date, addressing some of the big questions around Kitchener: was he homosexual or not (does it really matter? ), was he a hero or not and what constitutes a hero. It was refreshing not to have to go through in great detail the last days of Gordon’s life in Omdurman – Brad refers the reader to other texts, as he does for other aspects impacting on Kitchener’s military career. This allows him to focus on the man and his reaction to the events – something he does with sensitivity and humanness. He tries to understand Kitchener as a military man of his time and does this adequately. Personally, I would have approached this from a different angle, but interestingly our conclusions coincide. Brad needs to be commended on his handling of the Indian Kitchener-Curzon crisis (c1905) and the Dardanelles issue (c1915). Both accounts are balanced and I believe the closest we’ve got to the truth of the situations where emotion and bias have been removed (as far as they can be). This I know from my working on the material available has not been an easy task to achieve, especially as Kitchener left so little of his own versions of events. Overall, this was a satisfying read as well as a spur to get my account of the great man’s life completed. Thank you, Brad. And in case you’re wondering what Kitchener has to do with Africa… he served in Egypt in the 1880s and 90s, was involved in the Zanzibar Boundary Commission (1890s), commanded in the Anglo-Boer War (1899-1902), was British Agent and Consul General of Egypt (1911-1914) and during World War 1 tried to keep East Africa out of the war. He also owned a farm in what is today Kenya.